Latino Conservation Week: Disfrutando y Conservando Nuestra Tierra is an initiative of Hispanic Access Foundation (HAF). 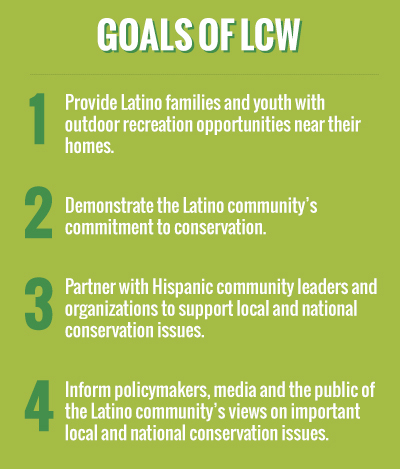 Latino Conservation Week was created to support the Latino community getting into the outdoors and participating in activities to protect our natural resources. Latino Conservation Week has also resulted in broader coverage of the Latino role in conservation in both English and Spanish media. It’s led to recognition from local, state and national elected officials of the important role Latinos play as stewards. Latino Conservation Week has emphasized the Latino community’s passion for the outdoors. Events can take any shape. It could be a private event for members of a congregation. It could be a community-wide public event at a nearby National Park or Wildlife Refuge. It could be a screening of the new film “Milk & Honey” with a discussion on the importance of the Colorado River. By participating in Latino Conservation Week 2019, your organization will be joining Latinos across the nation to support the protection of our natural resources. please contact the Hispanic Access Foundation team at info@hispanicaccess.org.